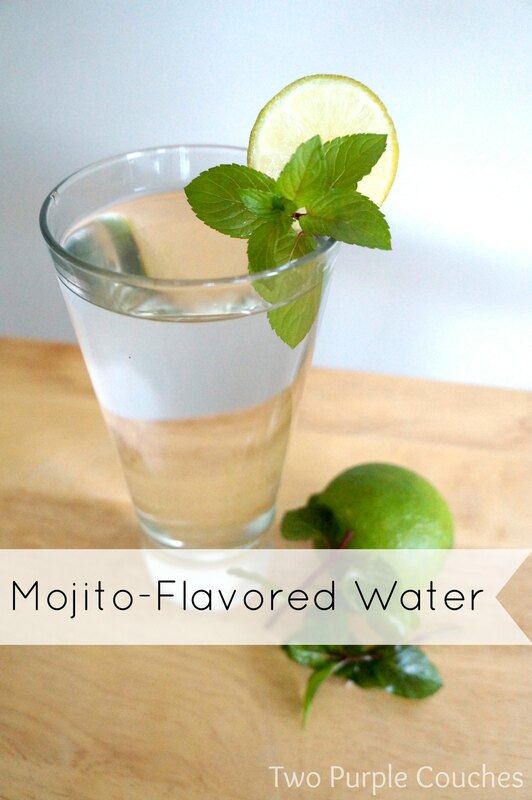 A couple of weeks ago, the lovely and awesome Thalita of The Learner Observer posted a whole bunch of delicious recipes for creating flavor-infused water. I’ve always loved a bit of lemon or lime in my water, but why not try some herbs? This entry was posted in What's Cooking and tagged beverage recipes, beverages, drinks, party drinks, recipes, summer on July 31, 2013 by Two Purple Couches. 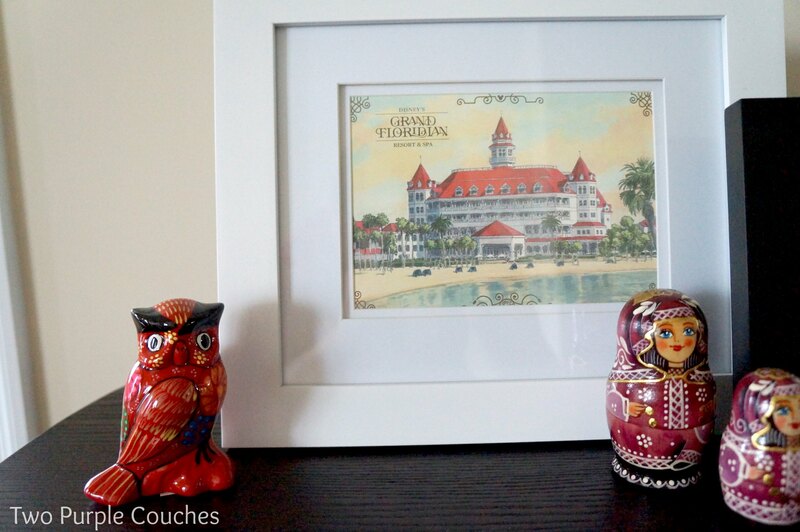 The postcard is of the Grand Floridian Resort in Walt Disney World. We stayed there in January (and it was amaze-balls! ); these postcards were free in our room! Score! The owl is also from our Disney trip, from a shop in Mexico at Epcot. I wish I could tell you that I purchased this set of Matryoshka dolls during my trip to Moscow a few years ago. But I can’t. I didn’t have time to shop. Or sightsee. I was there for work. My parents were traveling Alaska later that year, though, and my mom picked these up in a Russian boutique. To make up for my lack of authentic Matryoshka purchasing whilst in the real Russia. The “Bon Voyage” postcard was in an Umbabox I received a few months ago. It seemed fitting for the theme. The wooden ball, the terrarium/cloche thing, and the thing inside the terrarium/cloche thing are from Kohls. So, there you have it! 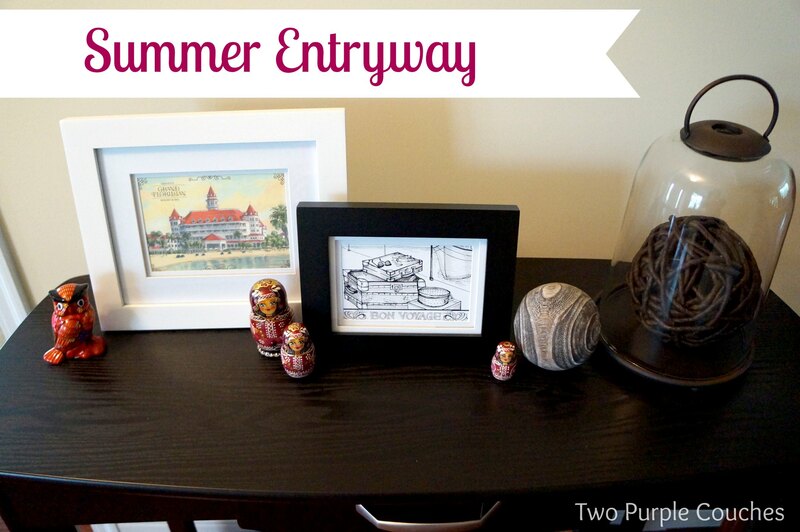 An entryway with some summertime flair. What’s in your entryway? Do you have an authentic set of Matryoshka dolls? Have you ever been to Moscow? 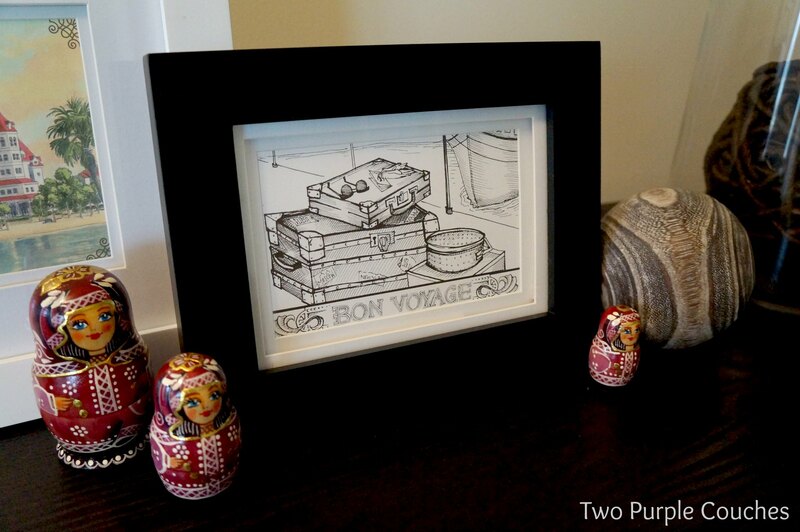 This entry was posted in Around the House, Made It Myself and tagged decor, entryway, Florida, foyer, home decor, home decorating, Moscow, Russia, summer, travel, Walt Disney World on July 6, 2013 by Two Purple Couches. We (okay, I) decided that this year, the vegetable garden was going to get a facelift. 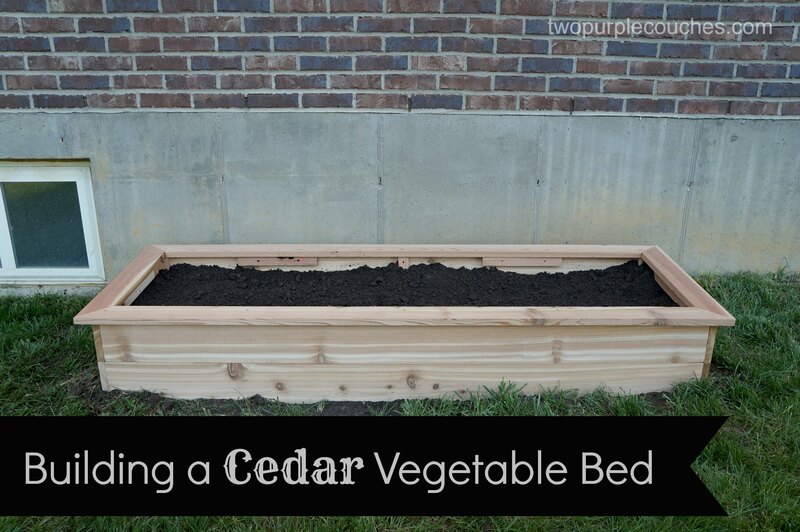 In the form of a raised vegetable bed! Tom was on board more so because he likes to build things than because he shares my vision of “living off the land”. I’m still trying to convince him of how awesome it would be to clear some of our overgrown woods and put in an apple orchard. This entry was posted in Made It Myself, The Great Outdoors and tagged diy, diy projects, gardening, gardens, homegrown, summer, vegetable garden on May 23, 2013 by Two Purple Couches. Neon is definitely not part of the current color palette in my home, but that won’t stop me from loving these hot home-decor picks! 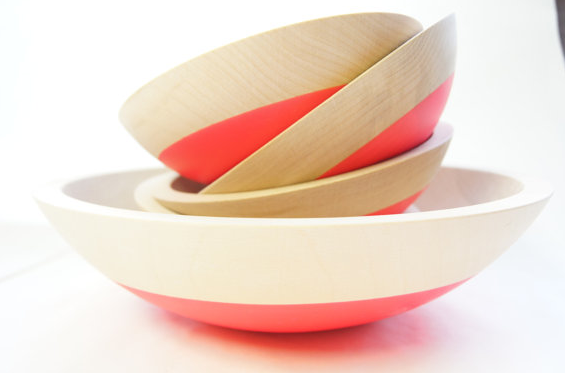 These bowls caught my eye a few weeks ago. They conjure up daydreams of a chic beach-side barbeque, complete with freshly made mojitos and homemade guacamole. For a smaller splash of neon, these coasters would be a great choice. 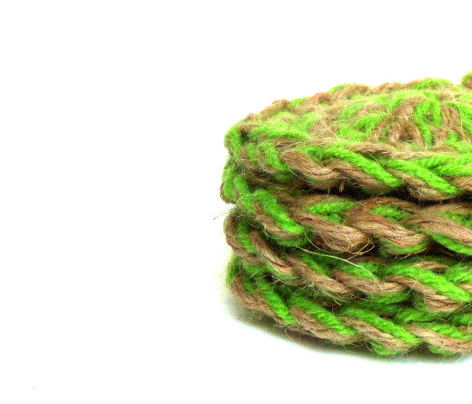 I can picture them on my outdoor table, cozying up to a cold glass of sangria. I’ve had a thing for chevrons lately. 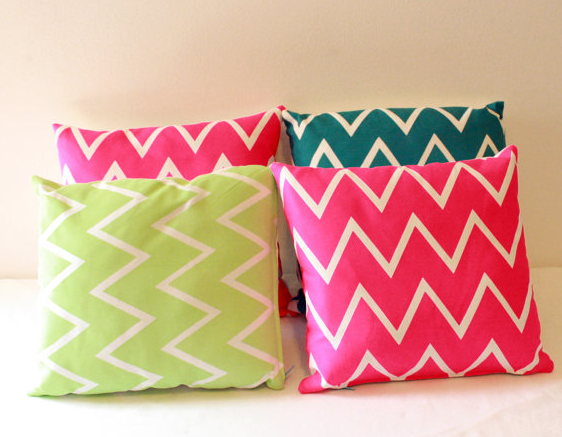 So when I spotted chevrons in a variety of neons, I knew I was in love! If you’re a little nervous about adding even small splashes of neon throughout your home, start with your closet! A neon top, belt, or even a fresh coat of nail polish in a vibrant hue gives you the freedom to test it out without a ton of commitment. What’s on your wishlist this week? This entry was posted in Made It Myself and tagged bowls, coasters, home accents, home decor, Neon, pillows, summer, Weekly Wishlist on July 25, 2012 by Two Purple Couches.